Poetry Reading: William Stafford Memorial, January 15, 2014, Roundhouse Series, Joe Bean's Cafe, La Grande, Oreg. 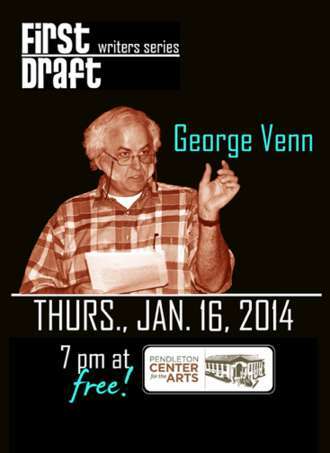 Non-Fiction Reading: First Draft Reading Series, January 16, 2014, Pendleton Center for the Arts, Pendleton, Oreg. Author George Venn, Professor Emeritus, reads from Keeping the Swarm, for EOU's largest Ars Poetica crowd ever. Public Reading, April 6, 2013, Oregon Cultural Heritage Commission "Discovering Oregon Originals"
Public Reading, April 7, 2013, Oregon Cultural Heritage Commission "Discovering Oregon Originals,"
12 January 2007, at 4:00 and 4:30 pm. Portland, Oregon, 12/ 11/ 06.